Musicians have long needed ways to catalog ideas and capture rough recordings of new material without the anchor that is a full-fledged recording setup. Apogee offers just that with its Jam guitar adapter for the iPad, iPhone and Mac, which allows you to strum your way to a record deal via an iOS device. Whether you're on the road or in your living room, the ability to connect a Les Paul to a mobile device and crank out the demo for your next hit is super helpful. 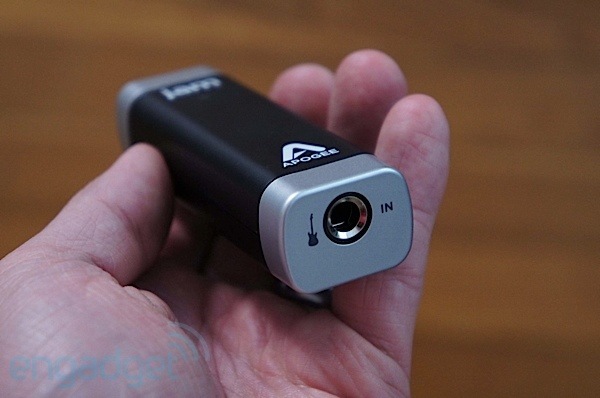 But, is it worth the $100 investment to have recording-on-the-go at your fingertips? Read on to see what we discovered. The Jam is successful in keeping you mobile while allowing you to still capture those sweet guitar licks. Shorter cables would help, but overall, this adapter works quite nicely. We'll be honest, there's nothing flashy here, but we don't think that something like the Apogee Jam necessarily needs to be another piece of eye candy. We'll be honest, there's nothing flashy here, but we don't think that something like the Apogee Jam necessarily needs to be another piece of eye candy. The adapter is pretty straightforward on the outside: guitar cable jack on one end with an output to USB (Mac) or iPad / iPhone on the other. There's only a single gain control wheel and a lone LED indicator that lets you know when the Jam is connected (but not ready), down to rock out or your input level is too high. Each of the aforementioned statuses has its own color -- blue, green or red. This is a nice touch, we have to admit -- especially the bit about warning you when your axe may be turned up to 11. The major beef we have with the adapter is the cables. In addition to the adapter itself, there are two separate wired connectors -- one for your iOS device and the other for you Apple laptop or desktop. Add those to the fact that we were already packing a guitar cable and would most likely have a charger in tow as well. If you're super concerned about every piece of kit in your bag, that's a decent amount of space dedicated to cables for mobile recording. In general, the length of the cables were also a bit cumbersome and seemed longer than they needed to be. We were using a guitar cable that provided all the distance we needed from the iPad, so the extra connector cable range never came into play. Perhaps a shorter, or even cableless, attachment would work a better. 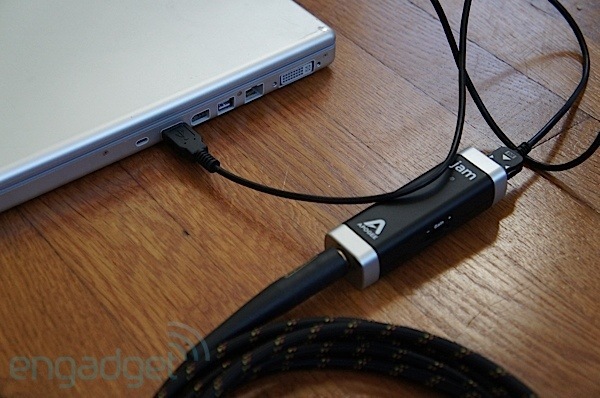 Something that clips directly on to the Apogee Jam itself whenever you needed to switch between capturing devices could provide relief from our cable woes. Apogee recommends that you use its guitar adapter with Apple's GarageBand -- either the app for the iPad / iPhone or the desktop version that comes standard on a Mac. Sure, we'd like to see some proprietary software, especially with the $99 price tag, but device compatibility makes up for this to some degree. 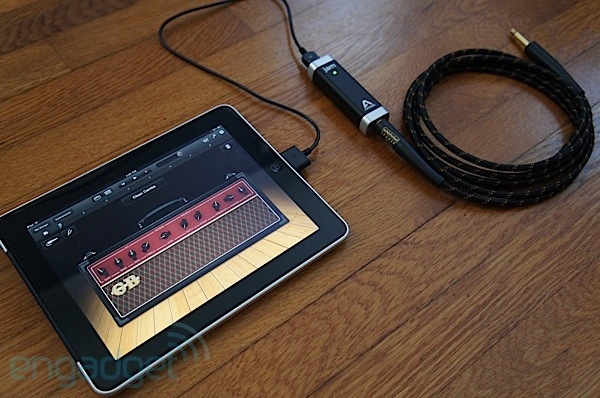 The adapter works great with GarageBand and with Amplitube, the recommended app for the iRig guitar adapter. [Update: We've heard from a few readers that Amplitube didn't work out for them. IK Multimedia says that while it is working on a software update that will make compatibility with the Jam a breeze, currently the app doesn't support a 30-pin connector. At this time, we can't recommend that you try Amplitube with the Apogee Jam until the update rolls out.] We also took the Apogee Jam for a spin with AmpKit, the software portion of Peavey / Agile Partner's guitar connector, the AmpKit LiNK. Connecting with the adapter was pretty simple, just plug in and play for the most part, adjusting settings in each app or on the axe itself as you go. Ease of use wasn't lost when we connected to GarageBand on a MacBook Pro either, as our experience was just as painless as our slate recording session. Recording went off without a hitch. We used an iPad for our main test partner, with the monitor option checked, we could hear the "amped" sounds from GarageBand with or without earbuds. You bandmates will probably lobby for the first option, but when you're safely in your home studio (read: living room), the latter is a nice choice to have. We tested the adapter with both a Washburn acoustic electric and a Fender Standard Telecaster -- both worked great and were captured on our slate with no issues. Don't fret if you're a bass player, Apogee promises that this rig will work for capturing your grooves as well. As far as guitar adapters for the iPad and iPhone go, there are a couple of other options that we've already mentioned and they could save you some dough as well. First, you could add the iRig and its software partner-in-crime, Amplitube, to your tour supplies. You can snag the adapter and a free version of the app for under $40, but if you're looking to go crazy with custom tones, you'll have to splurge for the $20 full version of the software. You'd end up with hardware and software for around $60, saving you a couple Hamiltons over the app-less Jam alone. You could also opt for the Peavey AmpKit LiNK for $30 and its application cohort AmpKit. While there is a free version of this software as well, you'll need to spring for the $20 paid version to get the full experience of building a customized mobile guitar rig. With AmpKit though, beware that you'll have to shell out even more if you want to expand you effects libraries or add extra amp emulators to your arsenal. The major difference with both of these options: the inability to connect directly to a Mac. In this case, it really comes down to a matter of preference. If you're goal is to hitch your mobile recording wagon to an iOS device, you could save yourself some coin with the aforementioned options. However, the extra perk of connection to a Mac is a pretty nice one and could come in handy from time to time. The real question is if its worth a few more dollars -- about $40 or $50 for the connector and base software. We're inclined to think that Mac compatibility is worth the added investment. 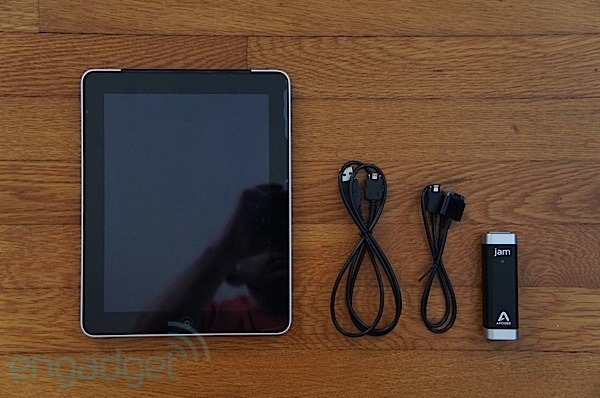 Update: Another difference between the Jam and the other devices mentioned here is that it converts the analog signal to digital by utilizing the iPad dock port. This results in a cleaner tone and wipes out any unwanted noise that you may encounter with an analog only adapter through the 1/8-inch headphone jack. 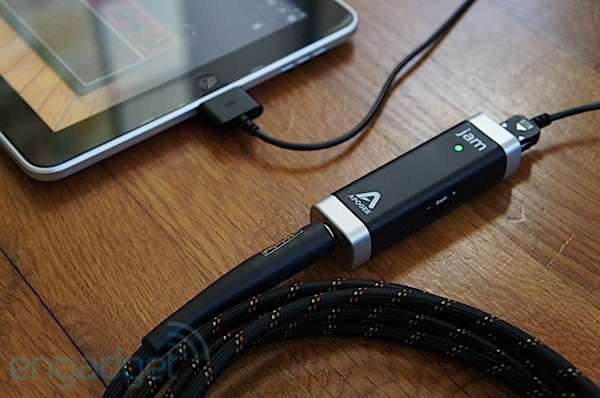 The truth is, the Apogee Jam is simple, straightforward and works well. We didn't encounter any connectivity or recording issues while we had our hands on the adapter. Aside from the cable length and lack of companion software, there's little we can gripe about. This would be a nice pick-up for anyone needing to capture tunes on-the-go who's looking for something a little better than a voice or digital audio recorder. We recommend that you spend some time with the free versions of both Amplitube and AmpKit to see if either of those cater to your axe-wielding sensibilities a bit better -- especially if you're not looking to turn your demos finished tracks via GarageBand on your PC. The Jam definitely accomplishes its goal, though, keeping you mobile and being able to record with ease, which is always a good thing.